The KMCS organisation began with the problem of ensuring access to the encroached farms of the tribals in the reserved forest and as a solution to this problem very early on it was decided to protect the remaining forest area and prevent it from degradation. This was done to counter the claim of the forest department that the tribals were destroying the forest. Consequently in all the hamlets of the study watershed social protection of the forests to ensure their regeneration was undertaken with small groups patrolling them by turns. The fodder generated from such protection is cut and bought by the members at the end of the monsoon season and the money thus generated is kept in a fund for carrying out plantation work. This forest protection has considerably increased the availability of fodder, fireweood and non-timber forest produce in the study watershed and this has especially benefited the women and children who are the main collectors of forest products. Greater fodder availability has facilitated goat and buffalo rearing and so increased the supplementary incomes from animal husbandry which provides an insurance against livelihood shocks to the tribal households. A survey done in the study villages by the youth has shown that there are as many as 63 species of trees, 8 varieties of vegetables, 7 varieties of grasses, 10 varieties of fruits and 29 varieties of herbs. The landscape in villages that have not participated in the KMCS mobilisation is barren and forest product availability is low. 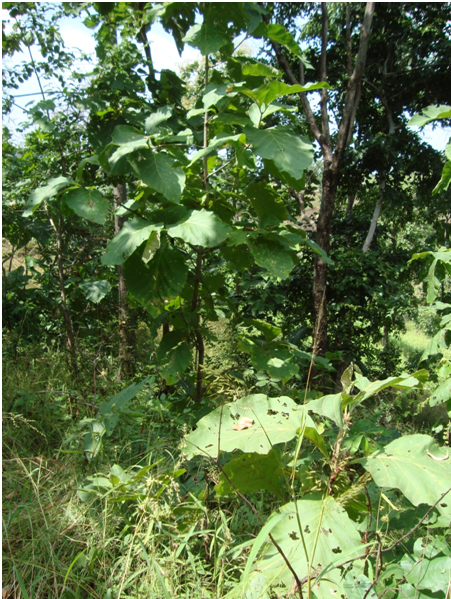 The picture of the regenerated forest in Attha village is shown below. The Scheduled Tribes and Other Traditional Forestdwellers (Recognition of Rights) Act 2006 popularly known as the Forest Rights Act or FRA has been plagued with problems right from the beginning. Even though the Act was passed in 2006 it took another year for the Rules to be framed and passed by parliament. Even after that the Madhya Pradesh government was very tardy in setting in motion the process for application and verification of the rights of the tribals. The KMCS had to organise a mass rally in Alirajpur town on 12th October 2009 to get the process started. Thereafter the Village Forest Rights Committees were constituted and the process of rights verification and distribution of rights deeds begun. The whole process has been plagued by the recalcitrance of the Forest Department and so even now only about half the claims have been resolved. The KMCS is continually monitoring the process and has through applications filed under the RTI Act been able to garner documented evidence of violation of the FRA by the district administration. This will eventually form the basis of a writ petition in the High Court challenging the legality of implementation of the FRA. Even so the implementation of the Act is the best in Madhya Pradesh with over 8000 individual rights deeds having been distributed so far. On the community rights front also over 60 deeds have been distributed and the process is still continuing. The most popular modus operandi for mitigating climate change at the moment no doubt is Cap and Trade – put a legally binding cap on the carbon equivalent emissions that a country will be allowed so as to ensure that the concentration of carbon dioxide in the atmosphere globally is less than 350 parts per million and allow countries and corporations to trade carbon credits which are equivalent to one tonne of Carbon released into the environment. Countries that have more credits than the carbon they are emitting can sell these surpluses. Also groups like that of the tribals who are conserving forests and land and are creating carbon sinks can be paid for this service under this arrangement. However, there are many problems with this primarily centred around the cap limit to be decided for each country because that will limit energy use and so development and growth and also involve huge investments in research and development of cleaner energy technologies. There is a clear developed and developing country divide here as the latter are saying that the former should bear the costs of having historically pushed up the concentration of Carbon dioxide in the atmosphere with less efficient technologies in the past. There are also concerns about the transparent working of the Carbon trading markets which even in their incipient forms have been exposed to speculative scamming of the kind that brought down the financial markets in the recent past. However, given the dominance of the centralised market economy it is very difficult to bring about such a radical change in the way business is being done today. In the interim, therefore, since some kind of a cap and trade mechanism is what is going to emerge from United Nations Climate Change negotiations, it is best to explore the possibilities that this offers for putting a communitarian foot into the developmental door. One such opportunity is the United Nations Programme for Reducing Emissions from Deforestation and Forest Degradation in Developing Countries known popularly by the acronym REDD. This envisages transfer of funds to developing countries for reducing deforestation and also in reforesting of already degraded forest lands. Since mostly indigenous people reside in forest areas around the world this then turns the focus on them. Consequently if the funds being transferred to developing countries were to be given directly to these communities then they would benefit greatly by being rewarded justly for their conservation efforts. At the moment however, no such arrangement exists and it is mostly the government agencies or private corporations in the developing countries that are appropriating the funds transferred under REDD. In the case of the organisation the forests and streams that have been regenerated legally belong to the government and so it is the government that has to make an application for carbon credits. The funds gained from selling these credits will also be paid into the government’s account. The government will not transfer these funds to the Panchayat let alone a non-governmental entity like the KMCS. At the moment the KMCS is campaigning for the government to transfer funds to the panchayats which have done this exemplary conservation work. But there has been no headway in this regard as it required setting up of a machinery to make this possible. The whole question of certifying that indeed conservation has taken place is a complex one and like other regulatory functions of the government this too will invariably become riddled in corruption. This is primarily the reason why indigenous people’s organisations are up in arms against such centralised control of their habitats. The KMCS, however, believes in pursuing a reformist path and so instead of opposing REDD lock stock and barrel it has been insisting that mechanisms should be set in place to transfer these funds to the communities that are actually engaged in collective action for natural resource management.